Introducing LES PINCEAUX DE CHANEL - a range of new brushes designed by the Paris Makeup Studio to make professional application an everyday luxury. 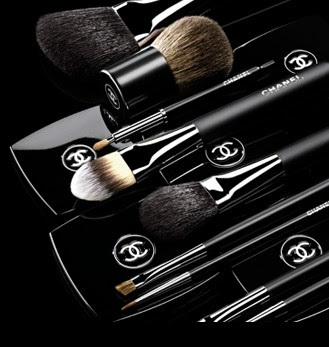 NEW CHANEL MAKEUP BRUSHES - Now available on the following websites Chanel, Neiman Marcus, Saks Fifth Avenue and also available at Chanel Boutiques. About two weeks ago Saks had already started selling some of the new Chanel makeup brushes on their website, while Neiman Marcus started this past weekend, and it wasn't until this afternoon that Chanel.com had them posted on their website. There are a total of 17 brushes to choose from: 7 face brushes, 8 eye brushes, and 2 lip brushes. I've heard that only Chanel.com and the Chanel Boutiques will be selling the complete line of makeup brushes that are available for purchase. So if you find that a brush isn't available at Saks, Neiman Marcus, etc., then be sure to check the Chanel website for it. Due to the price tag for some of the brushes I plan on purchasing several of the cheaper brushes to start and then I will make a weekly purchase of the more expensive brushes, just one at a time, until I can collect them all. Now, If some of the brushes look familiar, the #6 foundation brush for example, it is because it was released late last year. So if you purchased it then, that's one less brush you have to buy now. I've heard great things about the Chanel brushes and every time I've gone to a Chanel counter or a Chanel boutique for a makeover, the brushes felt so silky and smooth against my skin. It is always so relaxing! Once I've had a chance to try them myself then I will definitely post a follow up review. Designed as a professional artistry tool to be used with Chanel products, this powder brush perfectly adapts to the shape of the face for flawless powder application and blending. The natural brush hair is formed without using scissors or razors to deliver precise makeup results. A beveled shape ideal for setting powder foundation and sculpting cheeks and facial contours. Available only on Chanel.com and in Chanel Makeup Studios. Designed as a professional artistry tool to be used with Chanel products, this blush brush is tapered to highlight cheekbones and accentuate the contours of the face. 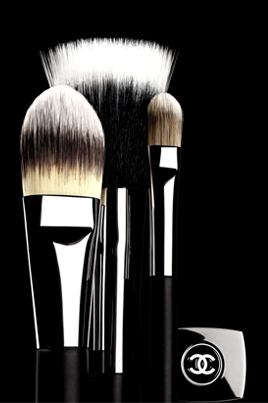 Designed as a professional artistry tool to be used with Chanel products, this blending foundation brush ensures flawless, even application of all foundation types, from fluid to cream to powder. The natural and synthetic brush hair is formed without using scissors or razors to deliver precise makeup results. Precisely applies and blends all concealer formulas. The ideal professional tool to correct imperfections and hide dark circles. Easily portable, this is the ideal travel accessory for applying all types of powder and blush. Applies and blends eyebrow pencil and powder. Use to define eyes or fill in eyebrows. Designed as a professional artistry tool to be used with Chanel products, this brush has a precise pointed shape that is ideal for defining and outlining the eyes. The natural and synthetic fiber brush hair is formed without using scissors or razors to deliver precise results. Designed as a professional artistry tool to be used with Chanel products, this brush has a rounded shape that is perfect for the expert application of shadow and liner along the contours of the eye. The natural and synthetic fiber brush hair is formed without using scissors or razors to deliver precise results. For precise application of eyeshadow on lids for different effects. Available only on Chanel.com and in Chanel Makeup Studios. Designed as a professional artistry tool to be used with Chanel products, this brush has a wide rounded shape that is ideal for the expert application of shadow, bronzer or powder on the eyes. The natural and synthetic fiber brush hair is formed without using scissors or razors to deliver precise results. Designed as a professional artistry tool to be used with Chanel products, this contour and shadow brush has a thin, rounded shape that is perfect for the expert application of shadow along the contours of the eye. The natural and synthetic fiber brush hair is formed without using scissors or razors to deliver precise makeup results. A slanted shape allows for precise and controlled application of lip colour for an even and professional finish. Available only on Chanel.com and in Chanel Makeup Studios. Designed as a professional artistry tool to be used with Chanel products, this retractable lip brush has a thin, slanted shape and a compact size that is ideal for the expert application of lipstick, gloss, and liner. The natural and synthetic fiber brush hair is formed without using scissors or razors to deliver precise results.